We all like catching big Bull Redfish. And during prime time of the year (August through November) these fish can pile up in predictable places allowing many anglers the chance to tangle with some real brutes. 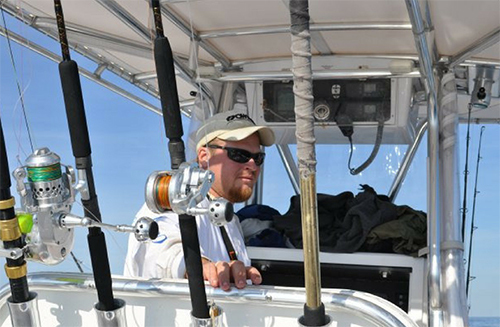 But as the season winds down these fish decrease in numbers and bites come at a slower rate, sometimes not at all. This is when I change from anchoring near structure and dropping cut or live bait to using artificials to probe the prime real estate for active fish. The payoff can be great and there are few things as exciting as having a 30 lb. Redfish try to rip that rod out of your hand as he pounces on your bait. I use this technique during the last two hours of the outgoing tide or the first two hours of the incoming tide. The prime times are mid-September through the end of November. I target the outside edges of rock piles or the jetties using my trolling motor to adjust my location. I pitch the lure slightly towards the center of the structure up current and alternately hop and swim the bait out through the edges of the structure. Most strikes come when the bait is either falling or paused. Be aware that occasionally the big Reds will swim under the bait and inhale it causing you to lose the feeling of the lure on your line. When that or any other hit happens crank up the slack, set the hook hard and fast then move the fish down current and away from the rocks utilizing your trolling motor and rod pressure. In very light or slack currents I use a Penn Battle 3000, but most of the time I use a Penn Battle 5000 spinning reel paired with a 7 ft. med heavy fast action rod. I spool the reel with 65 lb. braided line and 30 inches of 40 lb. fluorocarbon leader. I attach the lines with a barrel swivel to prevent twisting. I use 1 to 2 oz. jig heads, the color doesn’t seem to matter though I most often use white or unpainted. My lures of choice are the Hogy 8 inch paddle tail or 9 inch Eel tail and the 4 inch Gulp shrimp in the New Penny Fleck color. I have also had good results fishing a green and white Spro Bucktail with a Chartreuse or white trailer. I do use scent on any unscented lures and it does seem to help draw more strikes.